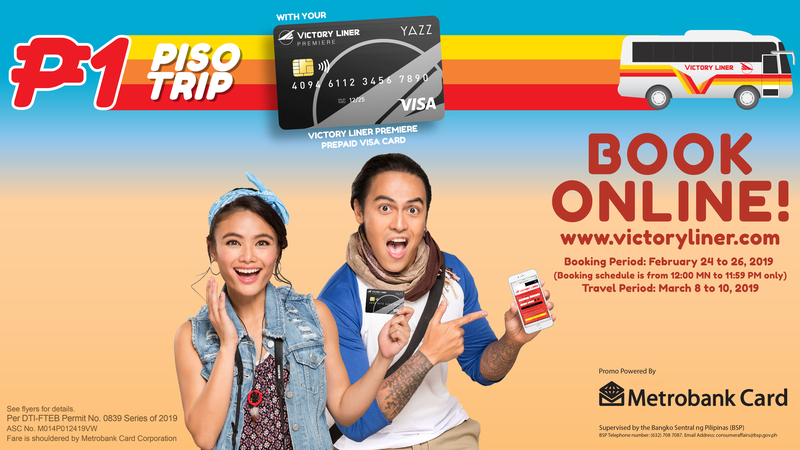 This promotion is open to all Victory Liner Premiere Prepaid VISA Cardholders only. Booking period is from February 24, 2019 to February 26, 2019 (12 MN to 11:59 PM). Travel period is from March 8-10, 2019. Bus trips going to the participating routes will only be charged P1.00, inclusive of online booking fee. The full price of the ticket will be subsidized by Metrobank Card Corporation (MCC), as promo owners. Promo is available only for tickets booked through the Victory Liner website. Allotment of seats per route per travel day is subject to the maximum seating capacity per bus schedule which is 45. Select your desired destination and departure date then click “Book a Trip”. Choose the departure schedule under the Piso Trip Campaign then click “Book”. Enter the last four digits of your Victory Liner Premiere card followed by your month and year of birth. Choose the return schedule under the Piso Trip Campaign then click “Book”. Type in your passenger information then click “Next”..
Click “Pick Seats” under Departure and Returning schedule to choose your preferred seat/s..
Click “Next” and click on the line “Please read and accept the Terms and Conditions”..
Click “I Agree” under terms and conditions. .
Click the “Pay now” button and click “Pay with your Victory Liner Premiere Prepaid VISA Card”.. Enter the last 10 digits of your Victory Liner Premiere Prepaid VISA Card number, Expiry Date, Card Verification Number and Cardholder Name. .
Click “Submit” to complete booking and payment..
After booking, a booking confirmation shall be sent via e-mail provided by customer in the Victory Liner website for verification purposes. Upon receipt of e-mail confirmation, please PRINT the voucher attached to the email sent to you. The voucher must be exchanged for a Victory Liner ticket at the ticket seller booth of the Victory Liner terminal where you will depart from. Please arrive at the Victory Liner terminal 45 minutes before your trip, to redeem your Victory Liner ticket from the ticket seller booth. Please bring a valid government issued ID that matches the name of the passenger printed on each voucher. Please present the voucher and your government ID to our terminal ticket seller to redeem your Victory Liner ticket. If the prepaid card owner is not part of the travelling party, the passenger redeeming the ticket must bring the following items: a) photocopy of the front portion of the prepaid card used; b) photocopy of a valid government ID of the prepaid card holder; and c) authorization letter of the cardholder that he is allowing the passenger to use his prepaid card. MCC reserves the right to cancel the ticket voucher if the customer is proven to have violated any provision under the Terms and Conditions of this promo. Only a maximum of three (3) tickets per cardholder is allowed during the promo selling period regardless of route booked. Promo applies only to participating route. Boarding time is 20 minutes before scheduled departure. Failure of passengers to present themselves for carriage within such time shall result in the cancellation of their reservation and their seats shall be given to chance passengers. Victory Liner Piso Trip tickets are non-refundable and non-rebookable except only in cases of force majeure or trip cancellations through the fault of the company, in which case the passenger has the option to claim a refund or rebook the ticket, without any surcharge, within fifteen (15) calendar days from the trip date written on the ticket. In case the passenger wishes to claim a refund, only the promo amount paid will be refunded (P1 per ticket, not P445). Rebooking may be allowed only for the succeeding trip schedule on the same day, subject to availability of seats and payment of surcharge (10% of the original ticket price of P445, not P1). Failure to show up on the time of the trip, or the succeeding time of dispatch of the same day shall result in forfeiture of the ticket. In cases of force majeure, Victory Liner reserves the right to cancel trips or change its time schedules and/or dates of departure without prior notice. Victory Liner assumes no liability for loss or damage of effects, luggage or other personal belongings carried by the passengers, unless these are declared and shown to, and a list thereof is given and freight charges are paid thereon to the shipping clerk or conductor, and the passenger complies with the instructions of the shipping clerk or conductor relative to their care and safekeeping. Lost passenger tickets for any cause whatsoever shall not be returned or replaced by Victory Liner and the passenger will be required to pay his/her fare anew. Any unauthorized erasure, alteration or tampering of the information stated in the ticket voucher emailed to you shall render it null and void. I have READ and AGREE to the Voucher Redemption Procedure, Terms and Conditions of Victory Liner tickets, and fees relating to the tickets ordered, where applicable. I have reviewed my bus ticket itinerary and therefore accept it as final.